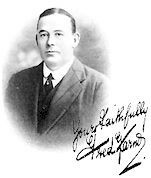 Fred Karno was born Fredrick Westcott in Exeter in 1866, the eldest of seven children of a cabinet maker. By the time Fred had become forty-eight he was already an entrepreneur of slapstick comedy with a flair for publicity. 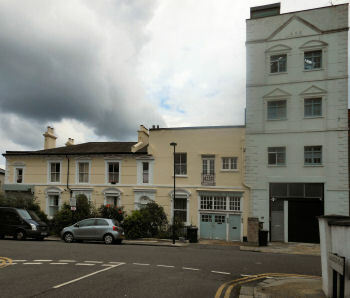 He built himself an elaborate studio headquarters at 26 Vaughan Road in Camberwell (renamed Southwell Road) known as Fred Karno’s Fun Factory. The Fun Factory employed two hundred staff, thirty touring companies appearing worldwide, with a repertoire of twenty-plus comedy sketches written and produced by Fed himself. The Fun Factory surprisingly enough is still standing and relatively unchanged after more than a century. It now comprises of Clockwork Studios which is a unit of companies. I visited it for a photo shoot one Saturday afternoon and was lucky enough to find a couple of the workers still on the premises. Once I explained my interest about Chaplin and the Karno Fun Factory, they were happy to show me some of their framed pictures displayed in the hallway from the glory days of the ‘Karno’s House of Fun’. I was told to make sure to visit the adjoining property belonging to Conor Masterson, an Irish photographer who was somewhat of a Fred Karno expert. Again my luck was in as after knocking on his door I found Conor was at home. I asked if his house was part of the Fun Factory, and to my surprise, I discovered that his house was Karno’s office. After Sydney Chaplin left the navy in July of 1906 he took a job as one of the principle comedians to appear in Karno’s pantomime sketches, working for the “Governor”. The Fun Factory became the hive of industry with all the props including curtains and backdrops being manufactured and painted on the premises. It is said that the very first custard pie to be thrown at the face was rehearsed in this establishment, and was invented by Fred himself. 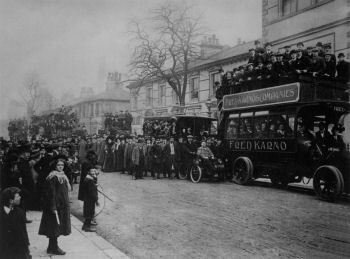 When Karno’s circus went on tour, the whole neighbourhood turned out to wave them off. There were several buses and charabancs lined up and full of the acts which were not only booked to play to audiences in England’s music halls but also travelling across the Atlantic to the United States, playing in Vaudeville, which is where Syd was heading for during his first year. After Syd’s return from the States back to London he attempted to get Karno to employ his kid brother, but Karno was having none of that. Syd finally managed to persuade Karno to interview and audition Charlie. Not too impressed with Charlie’s boyish face and his skinny five foot four height, and his nervous presentation, Karno decided to give the young lad a tryout in a sketch entitled The Football Match only as a favour to Syd, whose judgement he respected. That first night on stage at the Shepherd’s Bush Empire Charlie was duly aware he needed to be successful to gain a year’s contract with Karno. Mustering up all the tricks of the trade his mother had taught him he made his entrance on stage. When Karno came to see how Syd’s kid brother was doing two nights later, the applause from the audience reassured him he had made the right decision. By the time Syd returned from playing shows in the provinces, Charlie had been signed by Fred Karno for a year, with the option to sign for another two years. 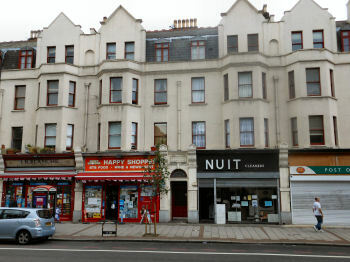 Now the two brothers both had good wages coming in each week and decided to buy their own property, a four-room flat at 15 Glenshaw Mansions, Brixton Road. During his first year with Karno, Charlie fell in love with a young Irish showgirl by the name of Hetty Kelly. Standing in the wings of the Streatham Empire one summer’s day in 1908 and waiting to go onstage, Charlie became infatuated with a young showgirl, who asks him to hold her mirror whilst she checked her makeup. This love affair was to last only eleven days, but the memory would last Charlie for many years to come. In 1916 he wrote a love song inspired by Hetty called “There’s Always One You Can’t Forget” Charlie was never able to wipe his first sweetheart out of his mind entirely, until sometime later when he learned of her death. Playing the drunken swell in the hit show Mumming Birds gave Charlie the part which brought him to the limelight. The part required Charlie to act as a drunken member of the audience who would heckle at the performers during the show. Knowing only too well how his father played the drunken swell and how Rummy walked about erratically the Chaplin genius soon shone through, as the audience revelled in this comical drunk. During the winter of 1910 whilst Charlie played a cockney in the lead role in The Boy ‘Ero At the Holloway Empire, Alf Reeves, Karno’s troupe manager, talked Karno into sending Chaplin with the next Stateside tour a few weeks later. State after State, the Karno player’s zigzagged across America, from St. Louis, Minneapolis, St. Paul, Kansas City, Denver, New York to California, twice in the space of twenty-one months, returning to England in the late spring of 1912. Discovering on his return that he was now homeless as brother Syd had married and sold their Brixton Road flat, Charlie was once again on his own. Returning to the States aboard SS Oceanic during October 1912, this twenty-three-year-old cockney lad felt this time New York was his home. After a full years touring, the following October of 1913, Charlie had signed a contract with The New York Picture Company which had four associate companies including Keystone. When Mack Sennett first set eyes on Charlie he was surprised how young he was, expecting a much old man, and after filming Chaplin’s first picture “Making a Living” for Keystone, which they released on the 2nd February 1914, Sennett was ready to fire this young Englishman. Chaplin made more than 80 films over his long distinguished career. Chaplin was born just four days before Adolf Hitler in 1889. Even though Hitler hated Chaplin he grew a small moustache because of Chaplin’s popularity, just to make himself more appealing to people. Chaplin composed more than 500 melodies as backing sounds for his movies. Many of his film sets were designed by him and were based on places he knew in Kennington they include the Lambeth Workhouse gates for the opening shots of The Kid and Methley Street from the film Easy Street. Chaplin’s dead body was stolen for two months in 1978 by a group of Swiss Mechanics who wanted blackmail money. He is now re-buried in a vault in Switzerland encased in cement. Karno’s other major film artist included the Lancashire Lad Stanley Jefferson, who went on to become Stan Laurel. Fred Karno died penniless in 1941, after buying Taggs Island and building a hotel which also included a casino and naming it “The Karsino”. His grand houseboat the Astoria survives and has now been adapted as a recording studio by its present owner, Pink Floyd guitarist David Gilmour. It is still moored at Taggs Island on the River Thames near Hampton.